This week Just Asia focuses on International Human Rights Day, commemorated annually on December 10. The day marks the adoption of the Universal Declaration of Human Rights in 1948, turning 70 this year. While the Declaration’s universal values of equality, justice and human dignity continue to provide a beacon of light, its promise is yet to be fully realized. People around the world continue to face discrimination and violence due to their gender, beliefs and ethnicity. There is an increasing trend in Asia for governments to enact new regulations monitoring the use of social media and the Internet, further restricting people’s freedom of expression. Bangladesh’s catastrophic human rights situation has only deteriorated over the year. 2018 saw consistent enforced disappearances, extrajudicial executions and systemic torture and ill-treatment of detainees in custody. The incumbent government of Sheikh Hasina has systematically muzzled people’s freedom of expression and freedom of assembly and association using state machinery. 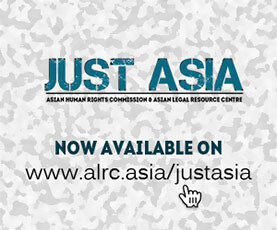 Just Asia speaks to the Asian Human Rights Commission’s Liaison Officer Mohammad Ashrafuzzaman to learn more. In Indonesia, victims of human rights violations and their family members gathered in front of the Presidential Palace to commemorate International Human Rights Day. They called for President Widodo’s administration to investigate past abuses and current human rights cases that remain unresolved. President Widodo will finish his term next year, having done nothing to address various human rights cases during his four-year Presidency. Next, India was elected once again as a member of the UN Human Rights Council for a 3 year fixed term this year. The same year saw the worsening of the country’s already poor human rights situation, with an increase in attacks against minorities and marginalized communities, including mob lynchings. Attacks against human rights defenders and outspoken journalists also increased, with numerous deaths during the year. Nepal saw a year of poor protection of human rights. The government introduced harsh laws to control the functioning of human rights NGOs and INGOs with its National Integrity Policy. Strict media regulations were also enacted, and the government is now also controlling the use of Facebook and Twitter. Most recently, the government has directed media houses to stop writing about 13-year-old Nirmala Pant, who was found raped and murdered on July 27. Since then, there has been no progress in uncovering her murderers. In Thailand, four years after the 2014 coup, democratic and civil space has been greatly reduced. The NCPO, the junta ruling body, has systematically arrested, detained and prosecuted persons for exercising their rights to freedom of expression and freedom of peaceful assembly. Since January 2018, the ‘We Want to Vote’ Movement has peacefully called on the NCPO to hold general elections. In response, the NCPO has filed complaints against a number of protestors. Next, Bangladesh’s former Additional Foreign Secretary Maroof Zaman, disappeared last year on December 4. A year later, there has been no convincing progress in the investigation of his disappearance. The rise of enforced disappearances and the absence of credible investigation and legal remedy goes hand in hand in Bangladesh. Just Asia speaks to Maroof Zaman’s daughter, Ms. Shabnam Zaman, from Brussels, Belgium. Lastly, Aung San Suu Kyi is likely to lose her honorary French Freedom of Paris for failing to speak out against the abuse of the Rohingya. Similar decisions have been made by the cities of Glasgow, Edinburgh and Oxford, while Canada has already revoked the Burmese leader’s honorary citizenship. The world has been outraged not only by Burma’s atrocious crackdown against its minority Muslim community, but also at the silence of Nobel laureate Aung San Suu Kyi, once touted as a democracy icon.